South Africa: The Rise and Fall of Apartheid examines the history of South Africa from 1948 to the present day, covering the introduction of the oppressive policy of apartheid when the Nationalists came to power, its mounting opposition in the 1970s and 1980s, its eventual collapse in the 1990s, and its legacy up to the present day. an expanded set of primary source documents, providing insight into the minds of those who enforced apartheid and those who fought it. Illustrated with photographs, maps and figures and including a chronology of events, glossary and Who’s Who of key figures, this essential text provides students with a current, clear, and succinct introduction to the ideology and practice of apartheid in South Africa. 13 Margaret Friedman speaks about the assassination of her partner, Dr. David Webster, and her search for his killers, 1989. Nancy L. Clark is the DeGrummond Professor of History at Louisiana State University. Her publications include Manufacturing Apartheid: State Corporations in South Africa (1994). William H. Worger is Professor of History at the University of California, Los Angeles, and his publications include South Africa’s City of Diamonds: Mine Workers and Monopoly Capitalism in Kimberley, 1867-1895 (1987). Together they have edited Africa and the West: A Documentary History, Volume 1: From the Slave Trade to Conquest, 1441-1905, (2010) and Africa and the West: A Documentary History, Volume 2: From Colonialism to Independence, 1875 to the Present, (2010). "South Africa: The rise and fall of apartheid provides a detailed, informed, and highly readable introduction to the major themes concerning apartheid South Africa, its development, evolution, and ultimately its collapse. It offers a quick and informative entry point for those new to South African history, covering a broad overview of key political, societal and economic issues. What makes this book particularly useful is the section assessing the diverse historiography, supplemented by a range of key primary documents from across the apartheid era. 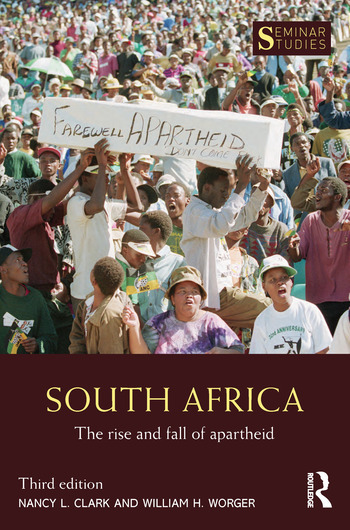 An analytical and accessible insight into apartheid South Africa." "Clark and Worger’s South Africa remains one of the most relevant yet accessible texts for students of Apartheid. Including key timelines, source documents and analytical essays this 3rd edition shows the universal demand for this important work which has been updated to incorporate life in post-Apartheid South Africa up to 2015." "The 3rd edition of Clark & Worger's South Africa is a wonderfully concise but extremely thorough account of apartheid, which makes the complexities and contradictions of modern South African history accessible to undergraduate students. The addition of electronic resources, films, and suggestions for further reading in the the 3rd edition not only complement the combination of narrative and primary sources within the text, but also serve as a valuable tool for instructional course design and student research. It is an ideal text for an undergraduate classroom." "This revised edition offers a timely and relevant introduction to a complex and still contested period of South Africa’s past. It is thoughtfully expanded to include primary sources and recent historiography which emphasize the social dimensions and repercussions of apartheid. Teachers and students of South African history will find the historical documents and the updated further reading (with new visual and online sources) sections particularly useful resources."